Most little boys and fathers around the world, especially Europe, can relate that going out to the park or any grassy area together to kick around a soccer ball is a right of passage. But, I wasn’t a little boy and we weren’t living in Europe. I was a little girl in Southern California in the 90’s. I first started playing soccer because my big sister did. And she only played because my mother secretly signed her up to my father’s dismay. He had expected us to be ballerinas or tap dancers, anything but playing a masculine sport with a ball. However, my father was soon persuaded. His red blooded competitive side prevailed and he embraced our sporting nature. Mine took a little longer to discover. On the field I was a nightmare. So much so that my parents were embarrassed for me and had decided soccer was not ‘my thing’. They were going to break the news that they preferred I tried another sport, but in a park randomly playing with my cousin (another girl) I figured out how to slide tackle and the rest was history. My sister, 4 years my senior, at the time had been playing goalie (the common way to refer to goalkeepers in recreational soccer, but it rhymes too much with rolly polly to me so I prefer goalkeeper). At this point in our lives my existence was to follow her every step, I was her shadow and I too wanted to play in goal. However, our bodies structurally were completely different. I was very tall and lanky so most coaches believed I was a natural forward, but as I already stated, striker was not my calling, nor was midfield or basically anywhere on the field. After some persuading my coach let me play in goal. I became the Hot Shots starting goalie and I fell in love with a game I had never really known. With a fluffy bow of pink and blue ribbons in my hair I’d slide into every oncoming attacker that got into 20 yards of me. And it usually worked. To help the rest of my game my dad would take me to a park and teach me how to catch. Bless his American football playing heart. I learned how to catch a ball but in a less than normal way. I would catch the ball and then quickly wrap my arms one on the top and one underneath the ball as a running back in football does. It was successful enough to get me selected to the recreational select team. That team decided to become a club team and on and on I went. I made the youth regional and national teams. Travelling not only all over the United States but internationally as well to Brazil and Italy. Italy had the most profound effect on me. I felt this magnetism drawing me to the country and I knew that one day I would return to play there. I was recruited to play collegiate soccer for a top university. At UCLA, my team made the Final Four in the National Championship, however one moment of the match would have a drastic effect on the rest of my life. I made a grave error and made ESPN Bloopers which led to me transferring across the country and to a completely new experience. I landed at Boston College, it was so different from UCLA it might as well have been a different country. While these were not the best experiences they were very valuable in teaching me to deal with adversity and to keep moving forward. Crucial lessons that would be very beneficial to me later in my career. I had always known that after graduating I wanted to play professionally and I preferred to do that in Europe, so I traced my family line and discovered we qualified for Italian citizenship. After playing detective and scouring the United States and Italy for all the documents, my entire family was granted dual citizenship with Italy. The second passport opened the world to me. For most teams in most countries to hire an American to play for a team is nearly impossible. It would cost the team more in taxes than female players are worth to the club. My travels led me to play in 5 different countries. I’ve played in Sweden, Italy, Holland, France and Norway and a couple of those countries more than once. A horrible injury sidelined me for over 18 months, but also led me to my fiancé so I can’t really complain. Through hard work and sheer will I was able to come back from what should have been a career ending injury, but was then plagued with many small injuries in my last season. During this period of consistent injury I knew my body wouldn’t be able to take much more, yet my love of the game also could not imagine letting go. I wasn’t ready and felt I had a lot more to give to the game that had given me so much. Scrolling through LinkedIn I had come across the advertisement from The FBA. I felt like it was fate. They even had a scholarship for women who qualified and I thought “why not.” I sent in a request and within hours Dorian had called me and described the program, I knew instantly this was where I was supposed to be going, but the price scared me. I was a female soccer player and while technically I had been professional for over a decade that only meant I wasn’t starving. I definitely wasn’t shopping at Louis Vuitton and driving luxury cars like my male counter parts either. Luckily I was accepted into the program and qualified for the scholarship. I couldn’t imagine my life today without the experiences of The FBA. Today I am a part of one of the best Football Business Programs in the world. 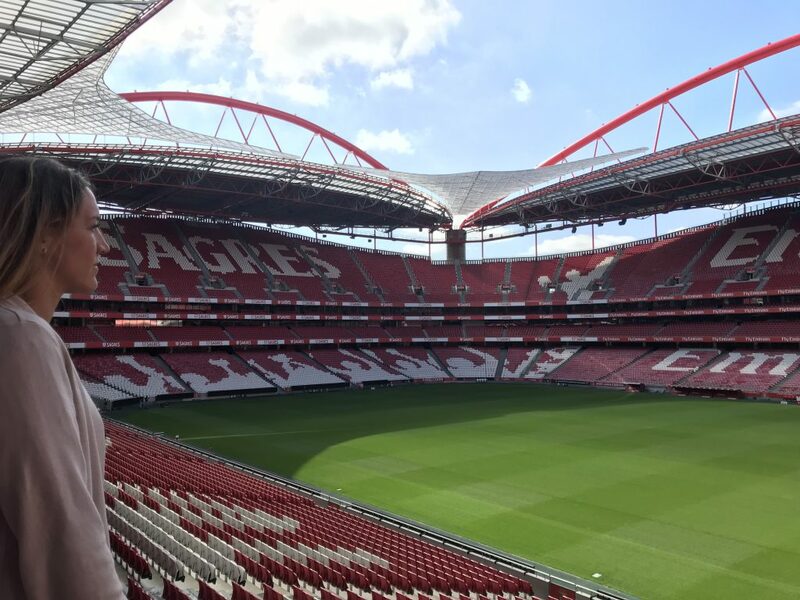 I am interning for the Marketing and Sales Department at Sport Lisboa e Benfica. 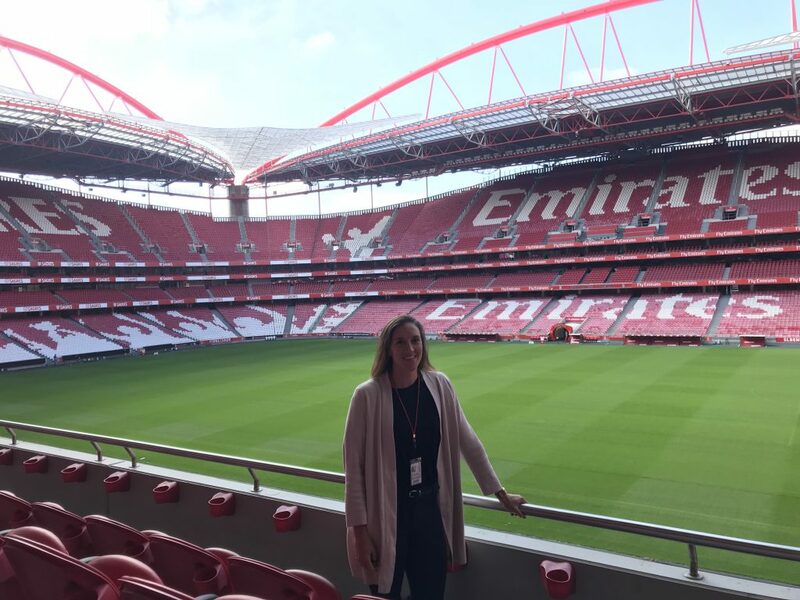 Upon arriving I sat down with almost everyone in the department who kindly and patiently walked me through what they do and how they keep Benfica running (all while looking out the window on Estádio da Luz). I am invited to sit in on interesting and important meetings where I am asked my opinion and they care what I have to say. Every day I come to work excited for what the day may hold. I’ve crossed paths with some of the greatest players in the game (I played in an inter-department football game against Rui Costa!) and I am a part of projects that could change a generation of players. I also have the opportunity to live in one of the most amazing and oldest cities in Europe, Lisbon. The experience is not all sunshine and roses, it’s hard being away from family, but all I have to do is think of the little girl who was told she shouldn’t play soccer and all the times around the world people looked at me like I was crazy, a women playing a man’s sport, what was I thinking? Then I look around my office overlooking one of the most storied stadiums in the world and I know every sacrifice and every game I ever won or lost has brought me to this moment and I wouldn’t give it up for anything. Arianna Criscione is a Candidate of The FBA’s Professional Master in Football Business 2nd Edition, expected to graduate in March 2019. She can be contacted via LinkedIn.